Queen For Seven Days (Hangul: 7일의 왕비; Hanja: 7 Ileui Wangbi; lit. 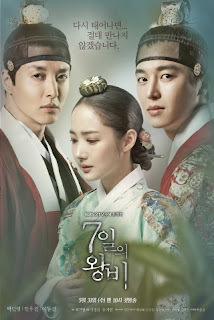 7 Day Queen) is a South Korean television series starring Park Min-young as the titular Queen Dangyeong of Joseon, with Yeon Woo-jin and Lee Dong-gun. It airs on KBS2 every Wednesday and Thursday at 22:00 (KST) from May 31, 2017. Plot: About the tragic love story between real life King Jungjong (Yeon Woo-jin) and his wife Queen Dangyeong (Park Min-young), who was crowned and deposed from the throne within seven days.